Crossing from science fiction to science, new findings in Nature pave the way for limb regeneration. 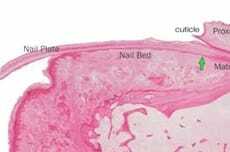 Researchers led by Mayumi Ito of New York University have isolated active stem cells in the base of mouse nail beds, which spring into action when digits are clipped. Importantly, the activity of these stem cells is regulated by the same molecular pathways as in reptiles that can regenerate entire limbs. However, if nails are completely clipped or there is little remaining tissue immediately below the nail, re-growth fails in mice.